Washington’s Olympic Mountains are wet. 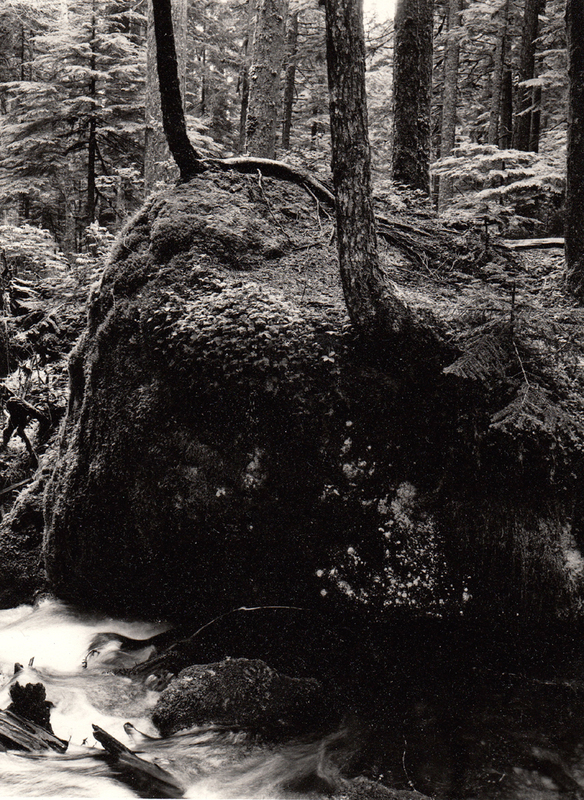 Their slopes are covered in rainforest, with broad ferns and tall redcedars with soggy, mossy bark. When it isn’t raining, it is drizzling and when it isn’t drizzling, the fog is so thick it soaks your clothes. The western slopes of the mountains average 140 inches of rain per year; its highest point, Mount Olympus at 7,965 feet, receives the equivalent of 220 inches, most of it snow. The Olympics are also steep. Everything in the Olympic National Park is vertical. Nearly every mountain is a towering cliff. Driving the 17-mile park road from Port Angeles to Hurricane Ridge, one side of the car views an uplift of rock only inches from the window while the other side looks out over cirques whose centers plummet thousands of feet straight down. Mountain goats manage to dance up the sheer wall of rock as obliviously as dervishes. 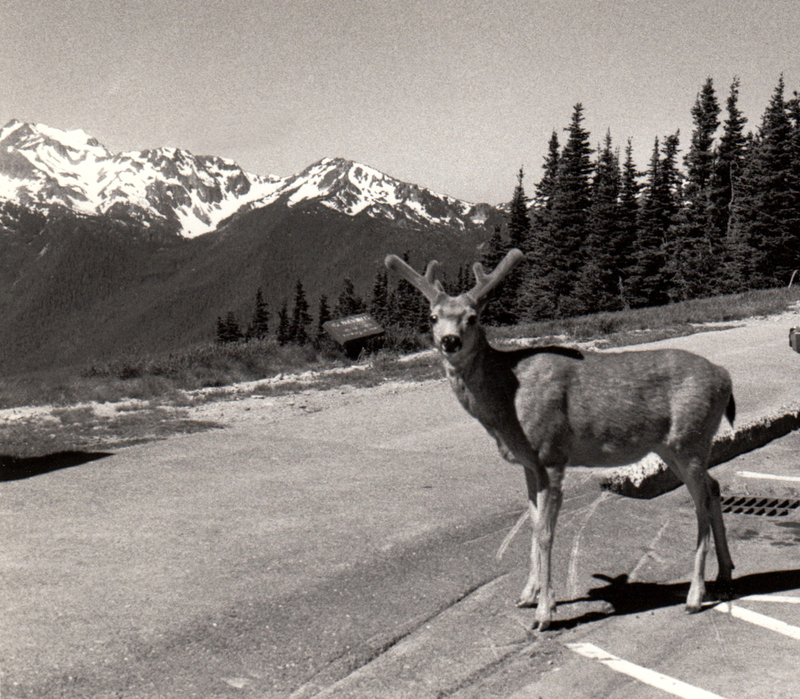 Hurricane Ridge is the place inside the park most accessible to the outer world, with a parking lot at the end of the road and a lodge and snack bar looking out over the Elwha Valley and the wall of peaks on the other side. Even in June, the spring wildflowers are just beginning to poke through the snowbanks on Hurricane Ridge. Clouds blow over the mountaintop and sometimes in the middle of a white out, when you are inside a cloud and cannot see what your feet are stepping on, you are treated to the peculiar vision of a hole in the scud, a circular opening that will drift past through which you can see 15 miles to the sunlit peaks across the valley. But my favorite spot in the Olympics is not Hurricane Ridge with its car exhaust and souvenirs, but the trail to Lake Angeles. Beginning at Heart O’ the Hills, it climbs 2,379 feet in 3.7 miles, or an average loft of about one foot for every eight feet. That is a grade steeper than any freight train can manage. And the first time I made that hike, I went with a friend who was a bicycle messenger in Seattle, with a stainless steel cardiovascular system. I made the first two or two and a half miles just fine, but the fatigue began to do me in, while my companion might as well have been riding an escalator. I continued, walking ever more slowly and thinking of Sir Edmund Hillary making those last steps up Everest at a snail’s pace, stopping to breathe after each choppy step. As the altitude changed, so did the weather. 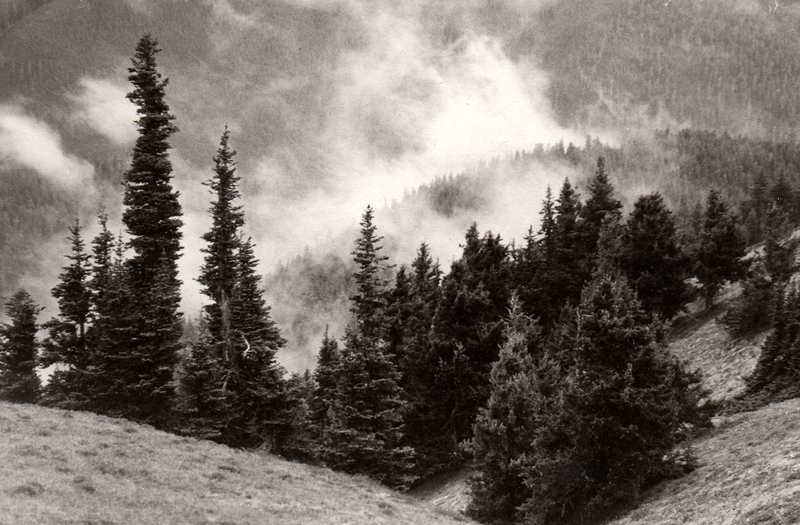 What was a pleasant 55 June degrees at the trailhead became sleety as we moved from the Hudsonian biozone, out of the Douglas fir and into the subalpine zone with its spruce and cedar. 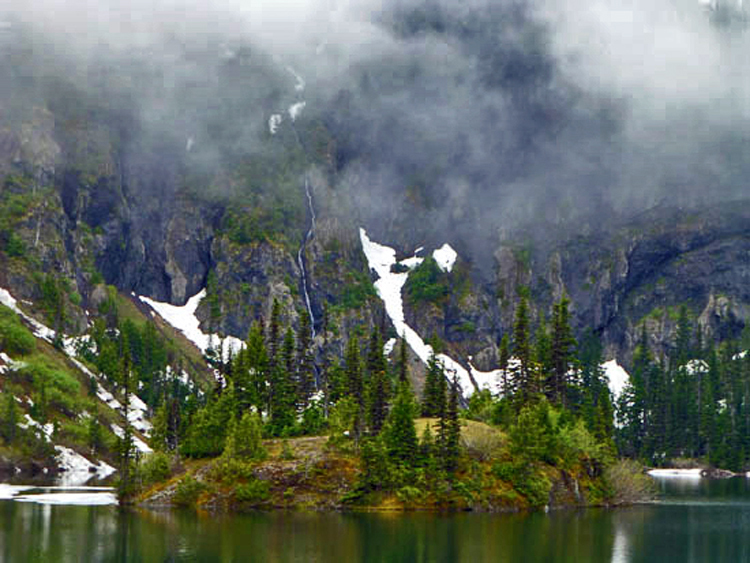 When at last the path flattened out and we turned out of the last cove and over the last ridge, we saw Lake Angeles. We had climbed from 1,879 feet to the lake at 4,196 feet and still above us, at the opposite side of the lake, were the triple peaks of Mt. Angeles rising to 6,454 feet. A sheer rock wall, partially obscured by mist, rose straight up to the jagged tops of the peak, like something from a Bierstadt painting. In the middle of the lake was an island covered with Caspar David Friedrich trees and the colors of the whole scene were Thomas Moran’s. I was standing in the mizzle, my glasses blotted out with droplets and my clothes too wet to wipe them clear. Across the face of the cliffs beyond the lake was a line of falling water like a John Martin lightning bolt zagging its way 400 feet down the rocks and silently roaring at its half mile distance into the gray waters of the lake. “We shouldn’t look at angels too long,” I said and we turned to descend. What makes a city urban? Those who live in the Western half of the country have to wonder sometimes. For Phoenix or Los Angeles — and most trans-Mississippi cities — are fundamentally different from the core cities of the East. The Western-model cities are sprawling suburbs, spread like a great tablecloth over the landscape. It isn’t that they don’t have character. LA has enough character for a dozen smaller cities. And even Phoenix has its personality, although it is that of a raw, unformed, undisciplined adolescent. But for anyone who grew up near New York, Philadelphia or Boston, there is something urgently missing out here that prevents the West from becoming authentically urban. Purists may argue that any concentration of population must be considered urban. And they are technically correct. But walk the Loop in Chicago or by the row houses of Baltimore and you instantly sense the difference. It is true that there are small bits of citiness in the West — a neighborhood in Denver, sections of Seattle or San Francisco. But these are fragments. There is one place that has undiluted citiness in concentration. On the banks of the Willamette River in Oregon is a true city. Portland has a downtown that could be a relocated Pittsburgh, bridges and all, and walking through its sinewed city center is a glory of chattering urban detail, all screaming out that this is a real city. For it is the details that define the urban. Portland is filled with the tiled floors, fireplugs, storm drains, eroded curbsides, overarching trees, root-buckled sidewalks and brownstone stoops that make a city feel urban. It is all the more significant because the Portland downtown is so tiny. You can walk almost anywhere you need to go. Yet in those 100 miniature city blocks — less than a square mile — you can discover all the urban detail, ornament and design that you need to serve as a madeleine to your Proustian nostalgia for a citiness. Along the sidewalk, a checkerboard of frosted glass squares underfoot illuminates an old basement. A brass fire-hose connection splits like a Brancusi torso. A dull iron streetcar track in the cobblestones is wheel-shined. An Art Deco 317 glows above the glass doors of the Loyalty Building. 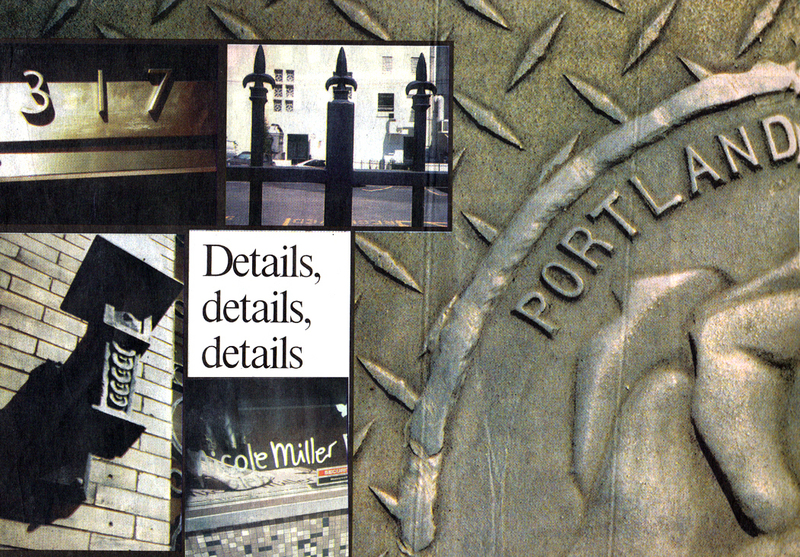 The city is built of hard, durable metals and stone, yet all its edges are softened and weathered. There is the steep ramp of the old brick parking garage. The spear points topping the black iron fences. The revolving clock-thermometer at the corner of the bank building. The equestrian statue in the middle of the park, with its benches and chess players. 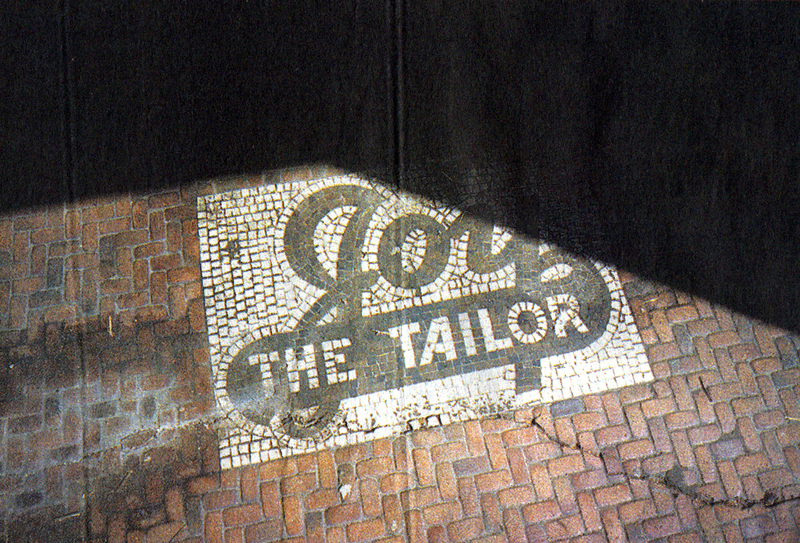 ”Joy The Tailor” is written in mosaic on the sidewalk in front of an empty storefront. Who knows how many businesses have operated in that building since Joy left? In front of a blockwide pit being dug out by the steam shovel, men on their lunch hours gather in a crowd behind a fence to stand and stare. One of them is eating a Fig Newton. The one thing all those details speak of is age. The rounded edges of the curbs, the worn writing on the manhole covers — these things come with maturity. The younger cities of the West — or the cities such as LA that seek eternal adolescence — cannot achieve the respectable age of the Eastern cities. It is a miracle that Portland survives. For in LA, as in Phoenix, any building older than our high-school years tends to be flattened and replaced with one of those brittle, obdurate, unweathered and machine-edged monoliths, too juvenile to know better, too inexperienced to have the wisdom time brings to sandstone and concrete. In a real city, you see the scoops of accumulated footfalls on the marble museum steps, you see ailanthus trees growing in the unattended spaces between buildings and moss on the gutters. A real city is a stage set for our lives. We eat at the lunch counters, recline in the grassy parks, live when we are young or very old in the plastered apartments above the storefronts, drink grappa at night in the jazz bars. The urban city is a setting not only physically but also historically. Its worn details, visible at every turn, remind us that we live in history, too. The city was there before us and will be after us. In a city of strident newness, such as Phoenix, we can forget the big picture and think we are all that matters. In a city full of its own past, you are always reminded of your grandparents and grandchildren. And it is all in the details. Imagine another Yosemite Valley, only 10 times larger and with a great river running through it, with twice the flow of the Nile. The Columbia River Gorge, between Oregon and Washington, is just such a place. And if it had not been settled and its river used for commerce from its earliest discovery, it would have been a cinch to be made a national park. Even so, it is still a National Scenic Area and runs 80 miles from near rain forest in the west to near desert in the east. It is a scenic prodigy. You can see its immensity best perhaps from the air. Flying up the Willamette Valley into Portland, Ore., the Cascade Mountains stretch out to the east like a great rumpled bedspread, green with trees. Above the range are the white, snowcapped cones of the huge volcanoes — the Three Sisters, Mount Jefferson and Mount Hood, piled Ossa-on-Pelion above the greener peaks below. As the plane turns west to land, you can see the Cascades continue north to Canada, and the white pyramids piled on top include Mount Adams, Mount St. Helens and, way out on the horizon, the biggest of all, Mount Rainier. But gouged out of the mountains, running east and west in the space between Hood and Adams, the gorge looks like a giant slice taken from the middle of a continental meatloaf. From the air, you can get some sense of the proportions of the gorge. It becomes easier to understand the geological processes that formed it, from the greenish Ohanapecosh Formation of mostly metamorphic rocks, some 40 million years old, to the many basalt flows and volcanoes that poured through the mountain valleys. Most astonishing might be the great floods that tore through the gorge during the Ice Age, some 15,000 years ago. Melting water had backed up across Idaho and Montana behind a dam of ice half a mile high. When the dam broke, 500 cubic miles of water — a fifth the volume of Lake Michigan — churned across eastern Washington and through the narrow gorge. 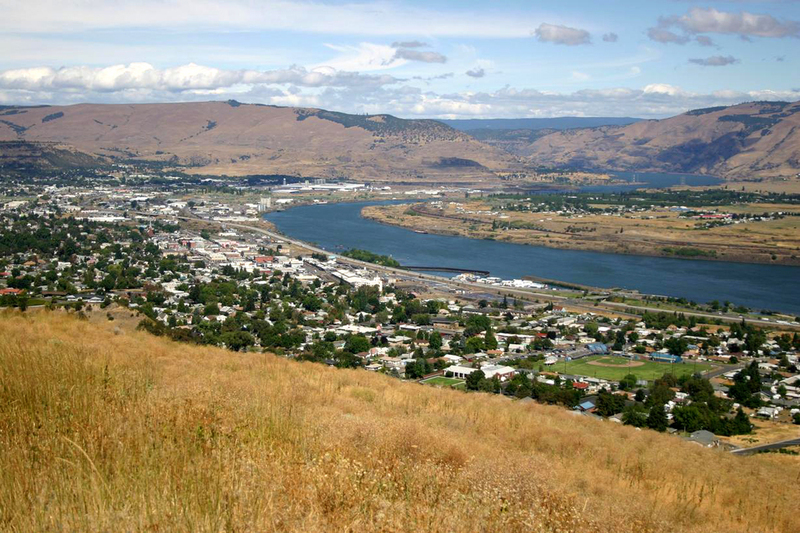 Water left its mark 1,000 feet above the present-day city of The Dalles. It is hard to comprehend the strength of the water. Nearly 10 cubic miles of water poured through the valley every hour for more than 40 hours — 10 times the flow of all the rivers in the world combined. 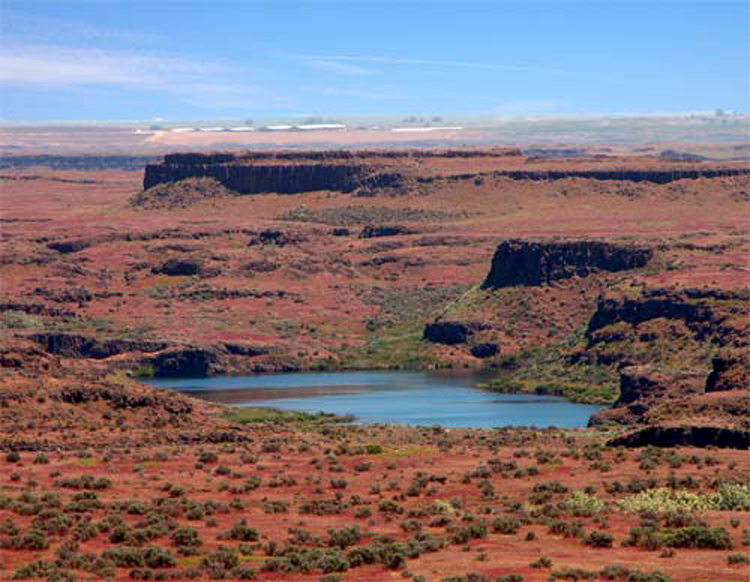 It washed eastern Washington bare, leaving behind the area we now call the Channeled Scablands, still largely naked rock. The ice dams reformed and rebroke as many as 100 times. Geologists believe the floods occurred on average about every 55 years for 2,000 years, widening and reshaping the Columbia River Gorge into its current U-shape. Indians lived along the river as long ago as 10,000 years. Europeans first sailed up it shortly after the American Revolution and an American named the river after his ship, Columbia Rediviva, in 1792. But it was the Lewis and Clark Expedition that literally put the river on the map. The expedition followed the river to the coast in 1805 and camped there over winter, looking for a clear Northwest Passage from the East Coast to the West Coast. By 1840, the Oregon Trail brought hordes of immigrants to the area, looking to farm and build new cities. They came down the river, by road where possible, but across the watery rapids in the tighter sections where no roadbed was possible. Nowadays, Interstate 84 follows the river’s south shore, or Oregon side, but it wasn’t until 1913 that anyone tried to find a way to build a continuous road through the gorge. 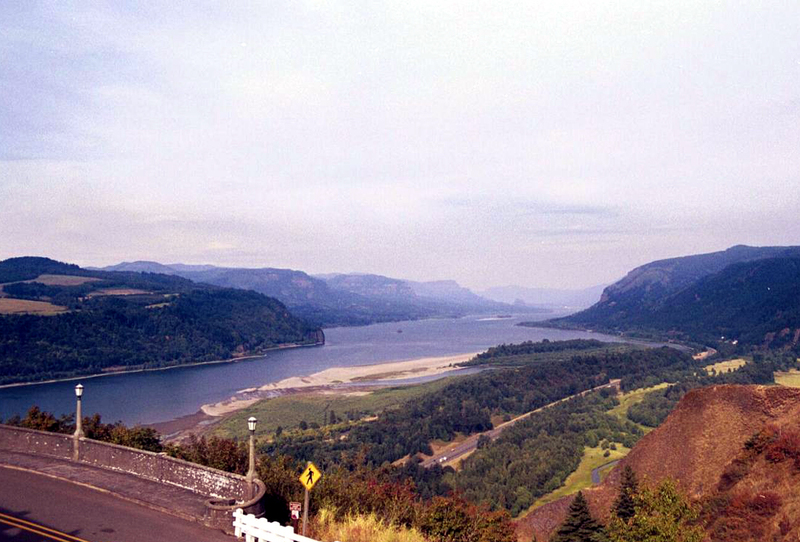 That road, the Columbia River Gorge Scenic Highway, has been superseded and largely obliterated by the interstate, but sections of it are still driveable — 22 miles from Troutdale to Dodson and nine miles from Mosier to Rowena. You can get the big picture from the air, but to really know the beauty of the gorge, you need to be on more intimate terms, and the remnants of the old highway — now called the Historic Columbia River Highway — are the best way to do that. Beginning in Troutdale, you drive across the Sandy River toward Springdale. 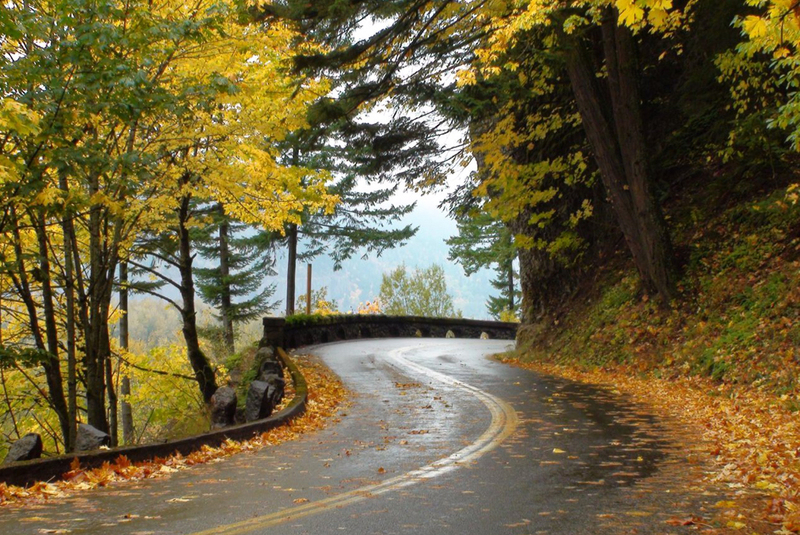 The road stays on the back side of the ridge, so you cannot see the river until you get to Portland Women’s Forum State Park, where a small parking lot affords a grand view up the gorge. You are on a bluff some 700 feet above the water, and the mountains pale into powdery blue as they recede. In the rake of morning light, it looks like a Chinese ink painting. A mile or so down the road, the next outlook comes at Crown Point and the historic Vista House built in 1916. The octagonal building serves as a visitor center for the gorge and has exhibits and a very good gift shop. It also has views for 30 miles in each direction. The highway climbs down the river side of the ridge and begins to follow the water and the interstate. Nevertheless, this section from Latourell Falls to Horsetail Falls is the highlight of the trip. The river is lined with a thousand-foot cliff, some 10 miles long, over which cascade more waterfalls per mile than any place in the world outside Hawaii. 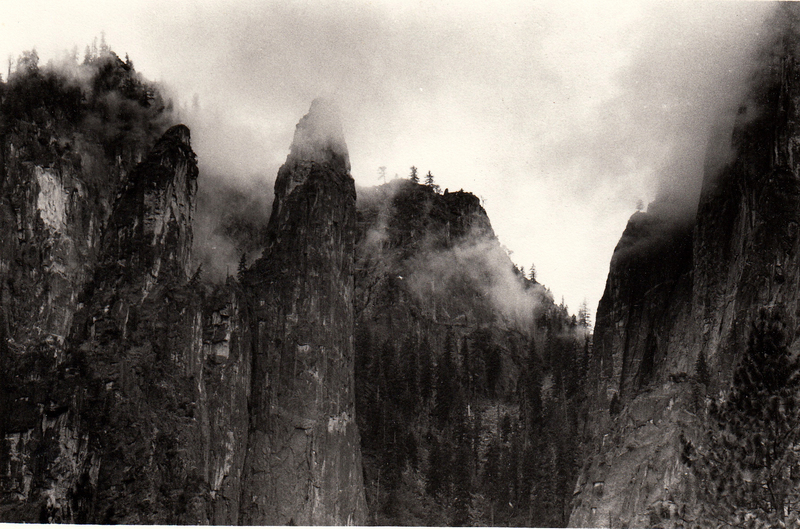 They jump off the top of the cliff and pour, almost in slow, misty motion, to the pool below. With names like Mist Falls, Bridal Veil Falls and Punch Bowl Falls, they give you a sense of almost tropical richness. 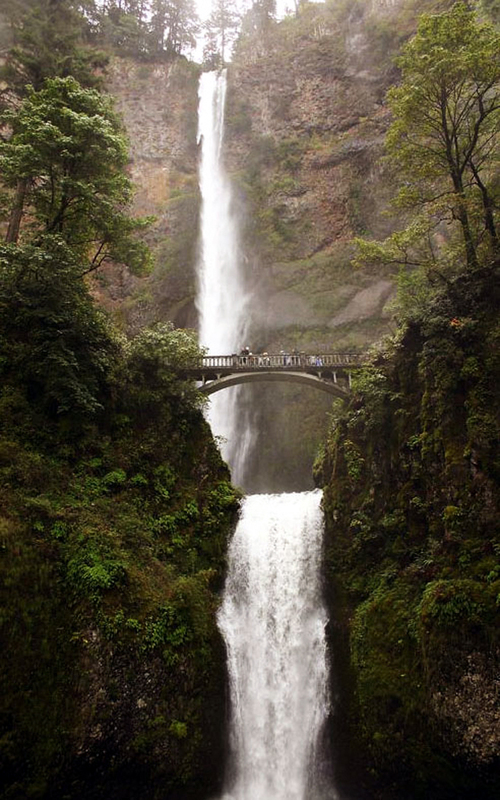 Indeed, just above the most famous of them, Multnomah Falls — with its parking lot and lodge — sits Larch Mountain, where the annual rainfall is 200 inches. Another 50 miles down the gorge, at The Dalles, the rainfall drops to 12 inches a year. The best view of the dry, eastern end of the gorge is from Rowena Crest, where an overlook sits like an aerie over the dry basalt hills near The Dalles. Grass is yellow in the summer, and you sometimes can look out over the shoulders of hawks. The eastern end of the gorge also can be quite hot. In July, the temperatures easily can top 110. 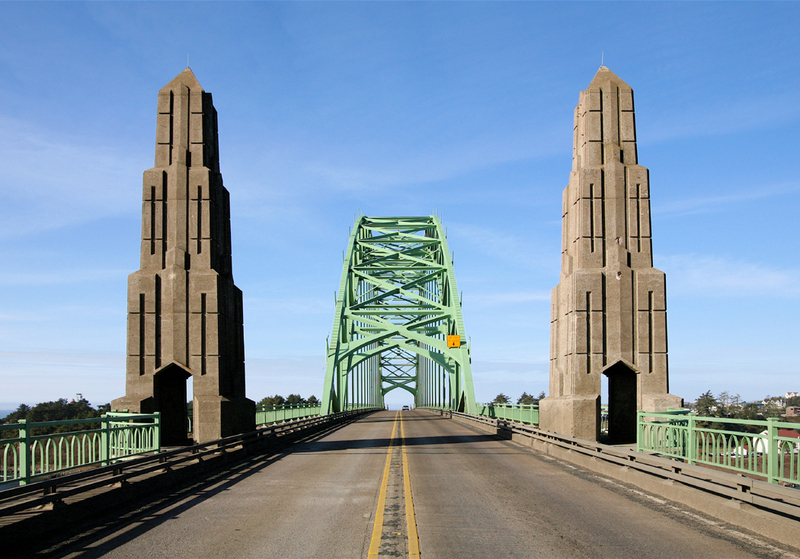 If you continue east on Interstate 84, past the Deschutes River, you can cross the Columbia on the Sam Hill Memorial Bridge at Biggs. Once across and in Washington, there are two other Sam Hill monuments you should see. Hill was the Washington mover and shaker who managed to get the early highway built. He also constructed a mansion for himself out in the blasted rocky grasslands. He called it Maryhill, and it is now an art museum with a respectable collection of work, specializing in Russian icons, art chess sets and the sculpture of Rodin. But the oddest Hill monument is the concrete Stonehenge he built in 1918 as a memorial for the war dead of Washington’s Klickitat County. 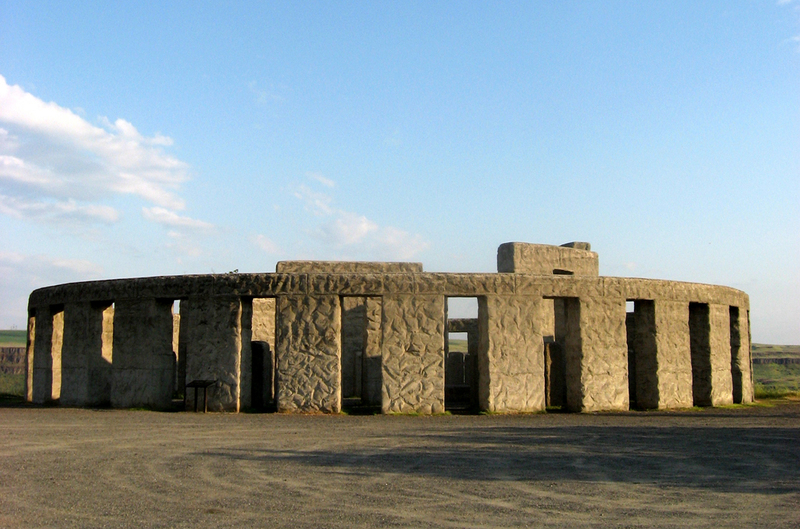 The imitation Stonehenge was meant to look like the original did when new, so it has a strangely antiseptic look, without the patina that age gives history. Coming back through the gorge on the north shore along Washington 14 — known as the Lewis and Clark Highway — you retrace your route with a whole different look. The desert gives way to the trees, and the smaller road twists around headlands and coves. At Stevenson, Wash., the Columbia Gorge Interpretive Center has exhibits not only on the geography of the area but also its history and culture. 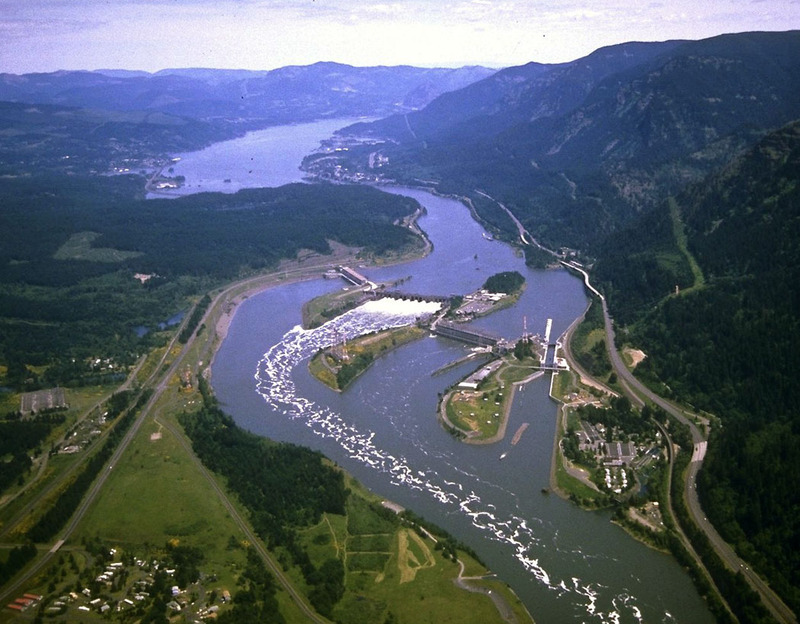 And near North Bonneville, the great Bonneville Dam blocks the river flow in five disjointed segments between four islands. It was one of the great public works projects of the Great Depression and opened in 1938. There are modern visitor centers accessible from each shore. The Bradford Island Visitor Center, reached from the Oregon side, is the larger, but the Washington Shore Visitor Center has the better view of the powerhouses with their huge generators. 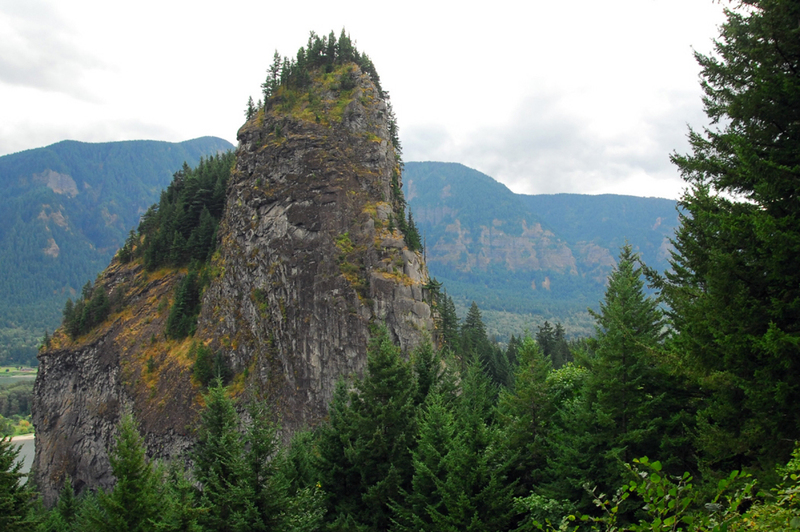 Further along, Beacon Rock stands like a giant upended football, 848 feet high, with a hairpin stairway up its side for adventurous climbers. It was named by Lewis and Clark and marks the beginning of Columbia River tidewater. The final monumental attraction of the trip is the skirting of Mount Pleasant and the section called Cape Horn, where the road barely holds onto the rock wall. Several turnouts offer a final glorious view of the gorge. All along the way, there are state parks and nature preserves. Wildflowers are startling, hiking is popular and so is bicycling. 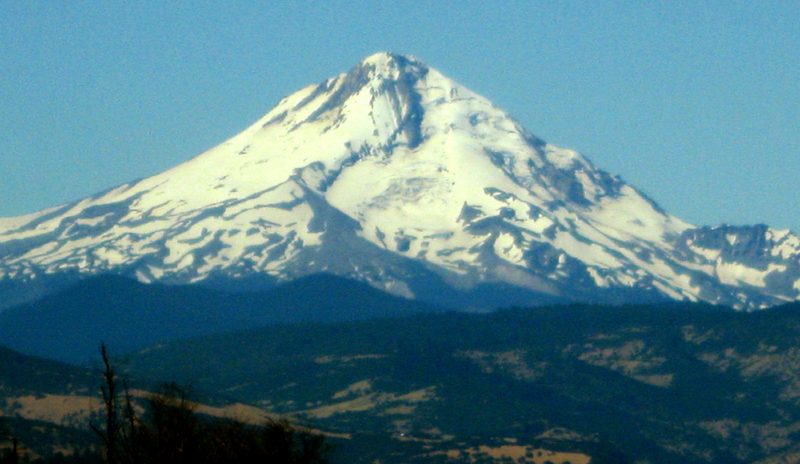 And above everything, you get the occasional unblocked view of white-headed Mount Hood, a beautiful, symmetrical volcano that is the symbol of the area. 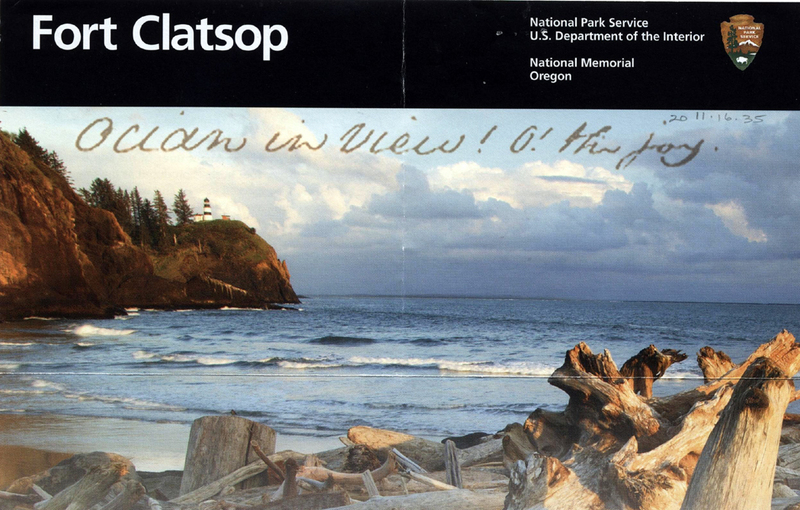 Most people visit Fort Clatsop in the summer and so miss understanding history. The only proper way to see it is in midwinter, when the air is as raw as frozen hamburger and the rain drizzles down into the fibers of your clothing. 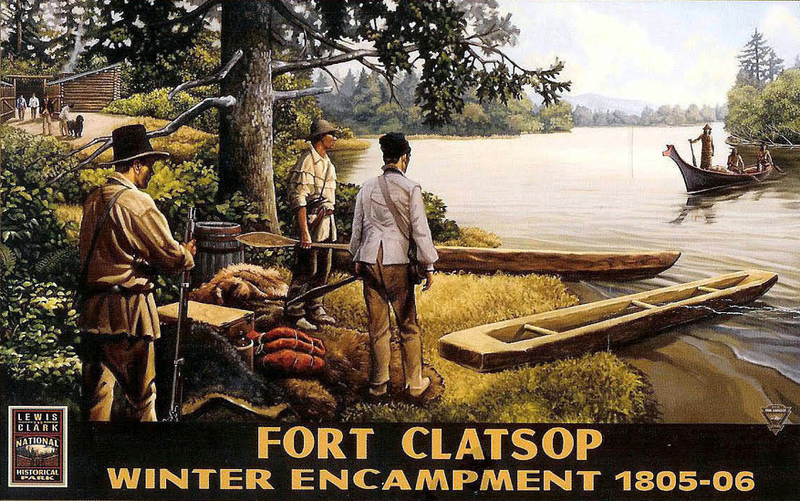 Fort Clatsop National Memorial is just a few miles from Astoria, Ore., and is where the Lewis and Clark expedition spent four cold months in 1805-06, waiting for the spring thaw so they could return to civilization. Meriwether Lewis and George Clark had led an expedition of 45 men up the Missouri River beginning in 1804, exploring the Louisiana Territory that President Thomas Jefferson had just bought from France. Lewis and Clark were charged with finding a way through the territory to the Pacific Ocean on the other side of the continent. 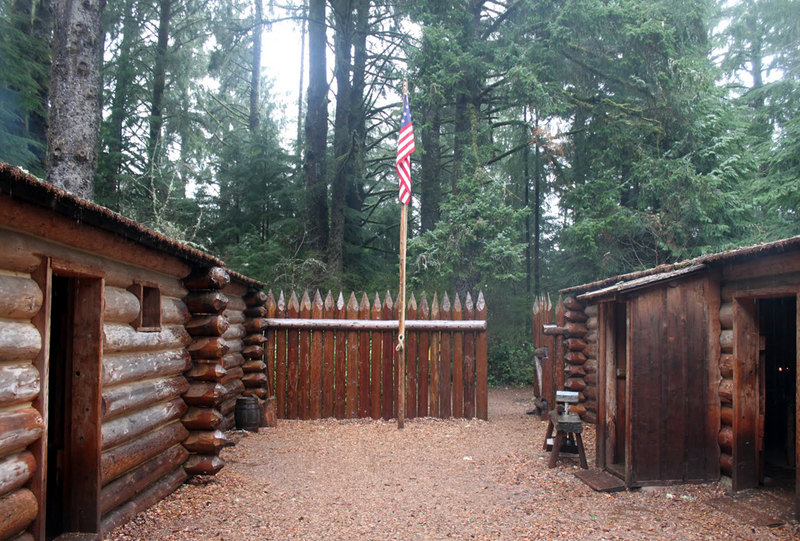 They spent two summers and a winter getting to the Pacific and another winter camped at Fort Clatsop, which they built as temporary quarters and a way to keep some of the constant rain off their heads. Of the 106 days they spent at the fort, the sun shone for six. Life was constant misery. According to their journal entry for the day after Christmas, 1805, ”rained and blew hard last night, some hard Thunder. The rain continued as usial all day and wind blew hard from the S.E. Joseph Fields finish a Table & 2 seats for us. we dry our wet articles and have the blankets fleed, The flees are so troublesom that I have slept but little for 2 night past and we have regularly to kill them out of our blankets every day for several past. maney of the men have ther Powder wet by the horns being repeatedly wet, hut smokes verry bad. Lewis and Clark were not hired for their spelling. The original fort is long since returned to the soil it came out of. But a copy of the original, built from the description and plans in the expedition journals, has arisen in the original location. The fleas have not been re-created for the modern visitor. It is a very small fort by the standards of anyone who has seen palisaded forts in John Wayne Westerns. It is exactly 50-feet square and divided into eight rooms, three on one side and five on the other, with an open plaza between them. This was technically called the ”parade ground,” but no parade longer than a pace and a half would be possible in its Lilliputian length. The largest room went to Lewis and Clark. 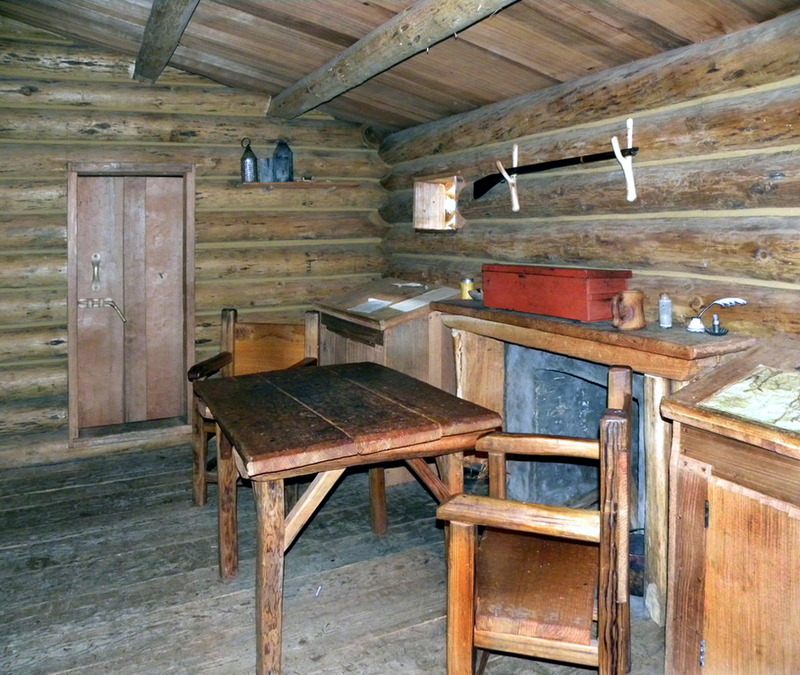 The three smaller rooms on one side were given over to the remaining crew, up to 15 per room. 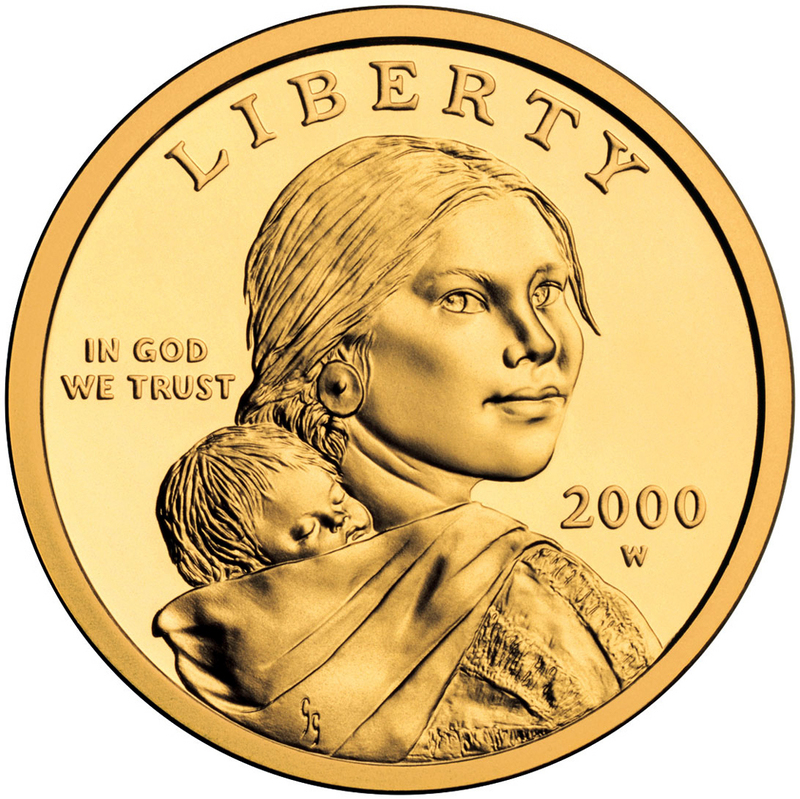 And the smallest quarters, next to the commanders’, was given to the French trapper Touissant Charboneau and his Indian wife, Sacagawea, and their infant baby. The remaining small rooms were a meeting room and a supply closet. In December, when you should visit the fort, fires crackle in the hearths of the rooms and volunteers give demonstrations of some of the things the explorers had to do. A class of visiting high-school students was divided into a group that used rod and chain to learn primitive surveying and mapping techniques; another group that attempted to write with quill pens; a third group that made candles out of tallow; a fourth group that learned how to blow a glowing flint-and-steel spark into a flame; and a fifth group that heard about animal furs. The smell of wood smoke penetrated everything. Hours later, I still could smell it in my coat. The smoke hung low above the log-cabin fort, which is a sign that canny weather watchers can use to predict rain. As if the prediction were necessary for an Oregon winter. In 1805-06, the men came down with influenza and other sicknesses brought on by exposure. They managed to kill and eat 131 elk and 20 deer. Lewis and Clark had to leave the fort earlier than planned when the early spring thaw drove the elk up into the surrounding mountains and left the men without a dependable menu. ”We have not fared sumptuously this winter and spring,” they wrote in the journal as they prepared to break camp. And when they reversed their route, they returned to St. Louis in half the time it took them to go out. 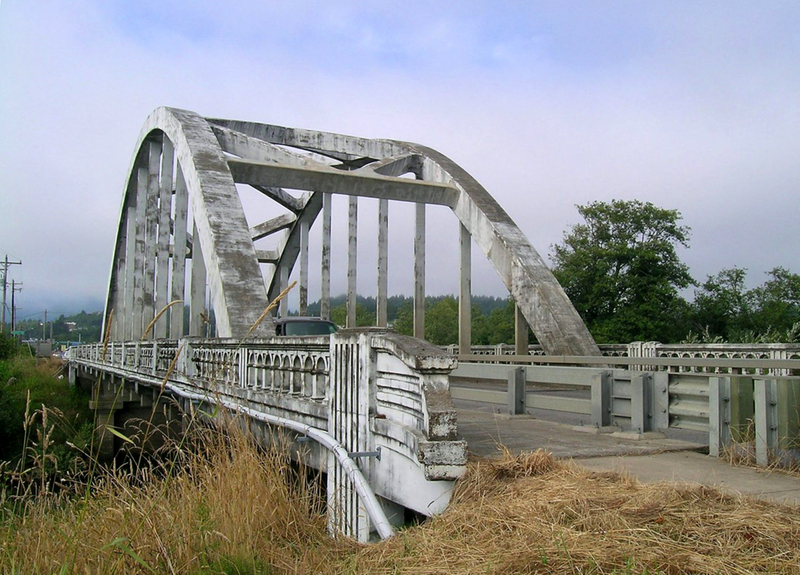 Tillamook has a more interesting history than most towns of its size and obscurity. While most towns north or south of it on the Oregon coast have catered to the vacationer, with beachfront motels and seafood restaurants, Tillamook remains a working town. And although it is situated along U.S. 101, which is the famous Coast Highway, Tillamook is back from the ocean, in a wide flat valley filled with cows and lumber. There are also a series of prominent mud flats. But the predominant impression is of green: vast pastures filled with cows. Tillamook is primarily a dairy town, with several cheese factories. There is a short-line railroad with a diesel locomotive painted in the black-and-white patchwork of a Holstein cow. Self-guided tours of the Tillamook Cheese factory are available, with samples of curd and Cheddar. 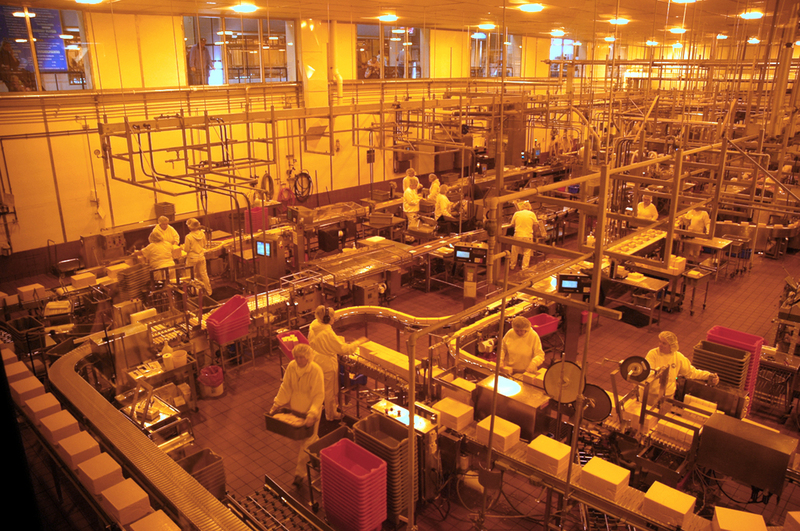 The factory produces 40 million pounds of cheese each year. You can watch it being made in 40-pound cubes and then cut by automated cheese slicers into smaller familiar sizes. An small army of snood-headed women watches over the assembly line to keep track of errant chunks of cheese and misshapen cubes. I briefly considered buying a whole 40-pound block but changed my mind when I discovered it would cost about $120. The fire had a 15-mile front and in only two days destroyed 255,000 acres. And the fire raged for four weeks. Fires recurred every six years until 1951, causing them to be named the ”six-year jinx.” Ultimately, 325 square miles were burned. It cost $13 million to reforest the blasted areas, which now look green and woodsy. Natural devastation also did in the vast land speculation known as Bayocean. 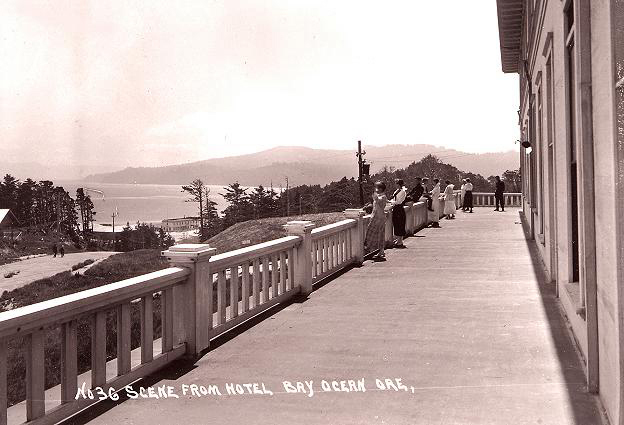 Beginning in 1906, a series of investors cooked up a scheme to turn a sand spit at the mouth of Tillamook Bay into a vacation paradise, with cottages, hotels and a gigantic natatorium with heated water. Lots were sold, buildings were built and sales were slow, in part because there was no way to get to the development. There were neither roads nor trains, and the yacht that was supposed to carry passengers across the bay was too large to pass over the mud bars. But more devastating was the fact that the builders hadn’t taken into account the nature of spits: They grow and shrink with the waves, and it wasn’t long before Bayocean’s cottages fell into the aggressive surf. 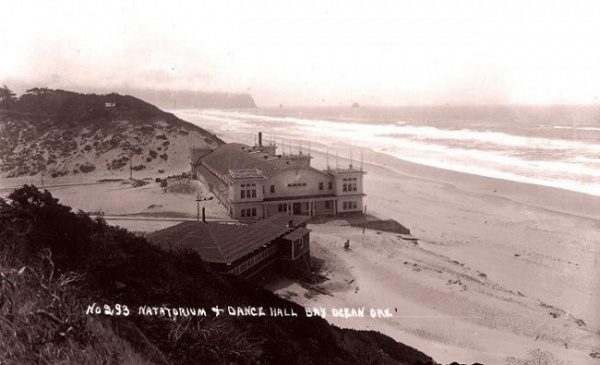 There was a brief period of prosperity in the community during the ’20s, but by 1932 the natatorium collapsed into the sea. In 1952, a storm split the spit into three smaller islands. The last vestiges of construction on the spit were wiped out in 1960. Today, it is just a story they tell in town. Another piece of Tillamookana, however, is still there to see, just south of town: the world’s largest wooden building. It is a blimp hangar built during World War II for the Navy. There used to be two of them, but one burned down in 1992 when its contents, $300,000 worth of straw, caught fire. The conflagration was so intense that the fire drew 80 mph winds into the hangar. The remaining hangar for now contains the Tillamook Air Museum, with a handful of World War II-era planes, a couple of blimps and some helicopters, along with interpretive exhibits that tell the story of the hangars and the blimps that were used during the war to patrol the Pacific looking for Japanese submarines. The building is 1,080 feet long, 300 feet wide and 195 feet high and covers 7 acres. You can’t miss it as you drive along 101. There are geological features listed on maps that are smaller than this great humpbacked mega quonset hut. 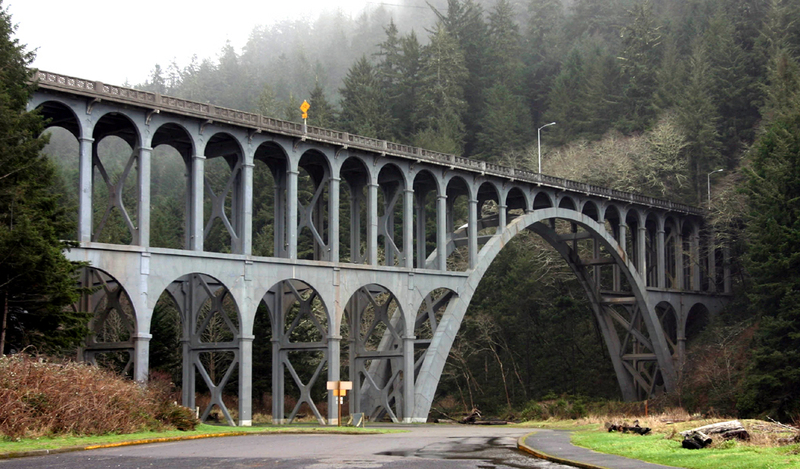 Forget the bridges of Madison County, the bridges worth writing about are on the Oregon coast. As the coastline meanders in and out along the Pacific, the roadmakers were faced with two problems: how to climb the rocky headlands and how to bridge the broad, flat river estuaries. They took care of the headlands with dynamite and pick, but the rivers were something else. First, they were unusually broad, combining, as they do, elements of river, estuary and tidal mud flat. The soft ground didn’t make it easy to anchor a bridge. Second, the usual material for building bridges in the early part of this century was iron, which tended to rust out very quickly in the salt-spray air of the coast. Consequently, most rivers were crossed only by ferry, even after the Pacific Coast Highway was dedicated in 1923. It wasn’t until federal matching funds were made available for highway construction, and later the Works Progress Administration kicked in, that the final T’s were crossed and the last bridges were installed. Now, bridges ordinarily don’t get me excited. I like a good bridge as much as the next guy, but I can’t claim to be a fanatic. 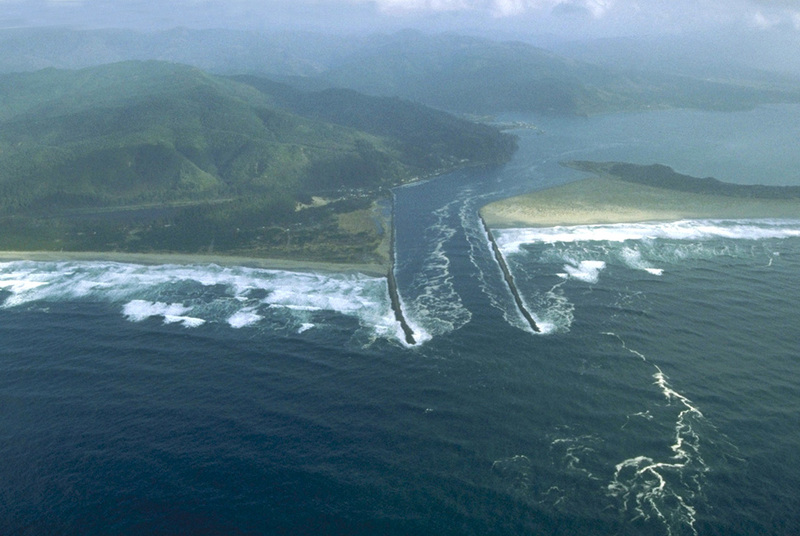 But the bridges that cross the Oregon coast are different. They are some of the most beautiful bridges ever built. And the credit goes to one exceptional man: Conde McCullough, a South Dakota-born engineer who presided over the Oregon Highway Department as bridge engineer during those critical years. His designs are admired both for their engineering skill — he was an innovative engineer and used many new techniques, including prestressed concrete, for the first time, or very nearly so — and for their aesthetic grace. I cannot speak with any authority on their technical aspects, but I can say that, taken as a whole, they are the most beautiful set of highway bridges I’ve ever seen. McCullough had a few recognizable habits. He used a good deal of Art Deco ornament on the bridges. Many have decorated pylons at the entrance to the bridge. Others have abstract floral scrollwork carved into their girders. And these certainly make the bridges distinctive. But it isn’t the ornament that makes them so satisfying to look at; rather it is the incredible sense of proportion and rhythmic movement McCullough managed to enshrine in his steel and concrete sculptures. 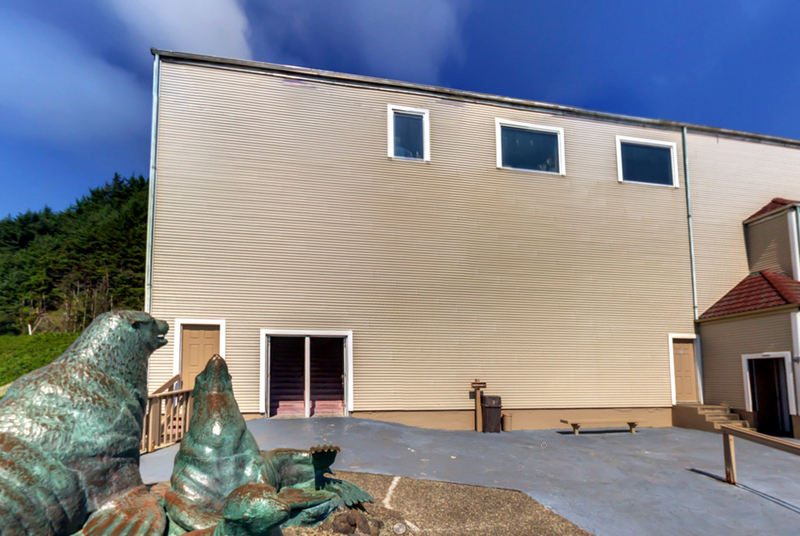 Anyone who has taken notice of the mint-green steel arches between molded concrete abutments that cross the river mouths on the Oregon coast will be able to recognize McCullough’s handiwork whenever else he sees it. 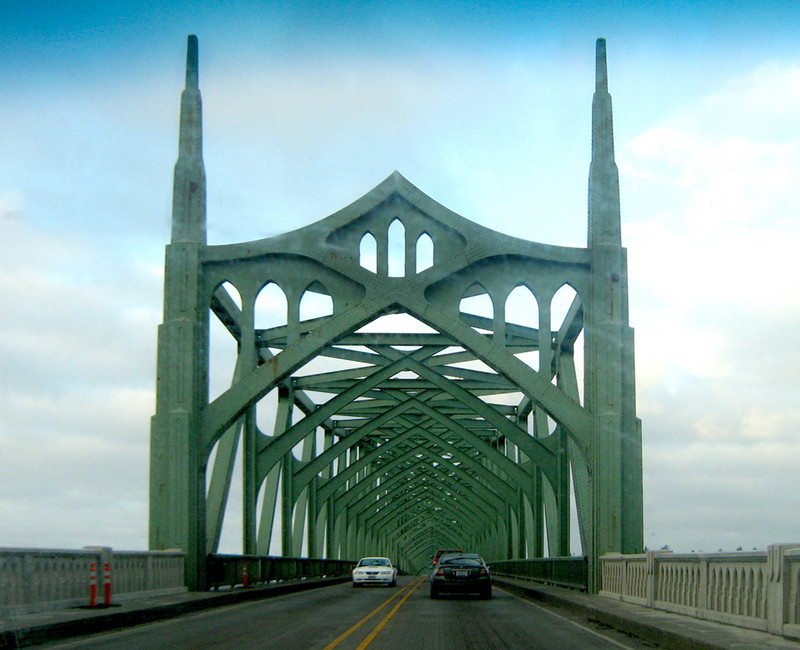 The bridge over Coos Bay, for instance, which now is named the McCullough Memorial Bridge, is a series of long arches like the path of a bouncing ball. Over them the roadway passes, rising slightly and connected to the arches underneath with a series of vertical beams, just the same graceful thickness as the arches themselves. And across the main span, an equally graceful series of steel girders crosses the roadway in a series of gothic arches, crossing themselves in a way reminiscent of the great crossed arches of Exeter Cathedral in England. As you drive across, you can’t help but have the feeling that you are driving down some great dignified nave. 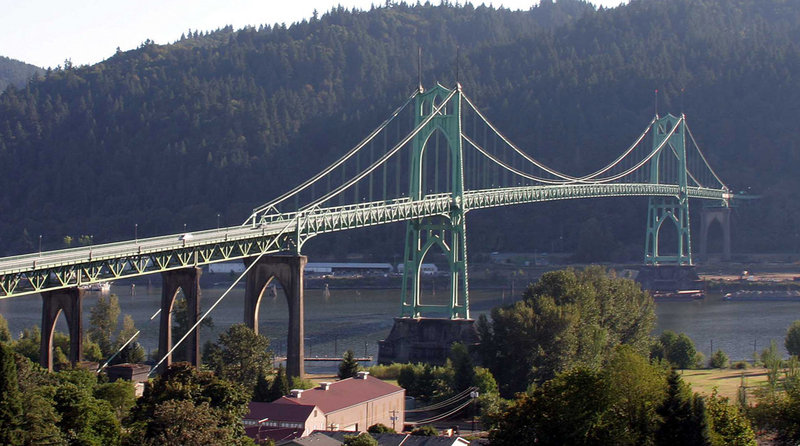 His bridge over the Rogue River is a counterpoint of tall, Roman-aqueduct-style arches against the longer bouncing-ball arches of the spans themselves. 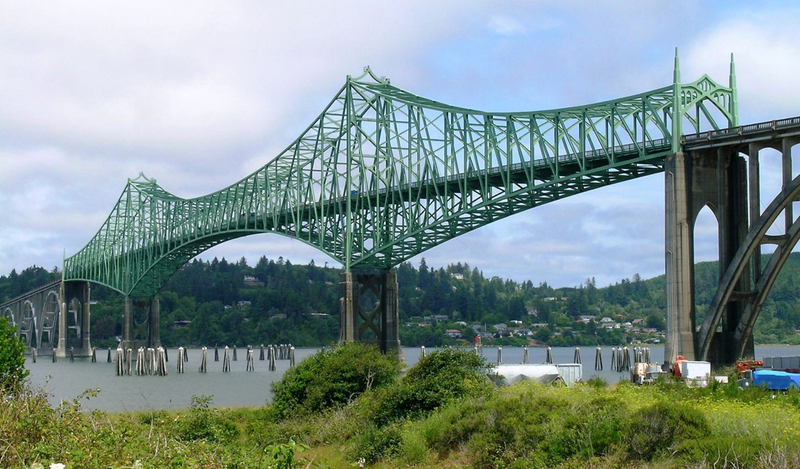 Built in 1931, it was the first structure in America to be constructed with the Freyssinet method of pre-stressing concrete and has been designated as a National Historic Civil Engineering Landmark by the American Society of Civil Engineers. 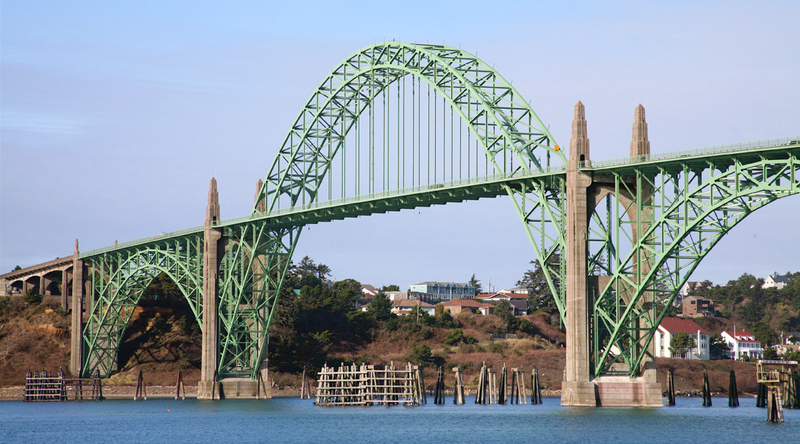 Three different types of arch work together in the Cape Creek Bridge at Devil’s Elbow State Park, and in the Yaquina Bay Bridge at Newport, the 3,223-foot structure is a graceful ascending line of highway supported by long, flowing arches, with a center-span arch that leaps high above the roadway. The center span is further set off by the concrete ”finials” that top off the support span. A lot of money has been spent on public art, but very little is of such lasting significance as these civil projects created by an engineer who was also an artist. 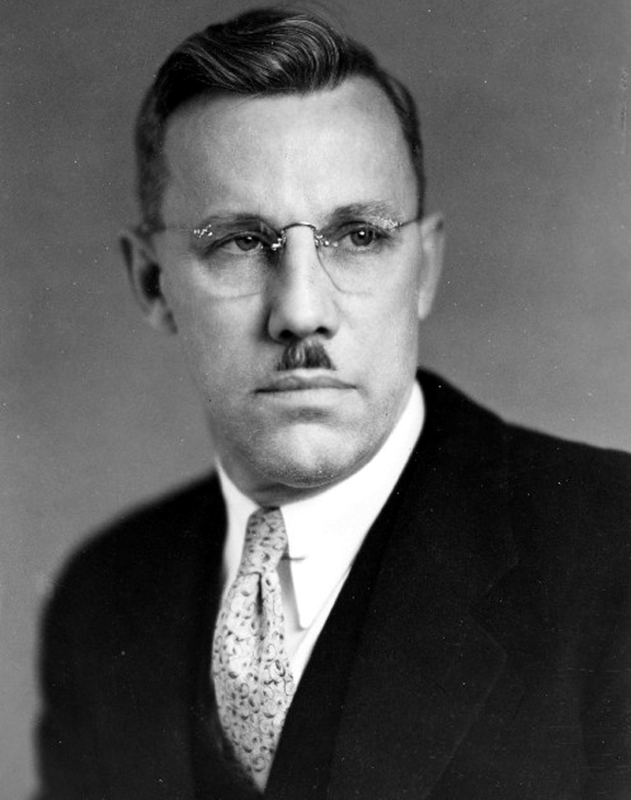 When McCullough died in 1946, he left a more lasting and distinct personal signature on the state than any political or social leader. The Pacific coast has its share of tourist traps. You can drive through the middle of redwood trees, see Paul Bunyan and Babe the Blue Ox at the Mystery Trees, or you can shop in a beached ship. Most of these venerable stops are getting on in years and it shows in the generally seedy look of weathered paint and warped lumber. And one of the oldest attractions on the Oregon coast had always sounded just as depressing. I had passed the Sea Lion Caves, about 10 miles north of Florence, several times, but had never deigned to go in. It was my loss. For although the caves first waylaid tourists in 1932, it is surprisingly well kept. The small shop at the top of the cliffs that serves as ticket booth and souvenir stand looks as if it were built last year. Your ticket gets you an elevator ride 208 feet down into the cliff rock, and when you get off, you are in a subterranean cave with a gallery view of the only mainland sea-lion rookery in the world. 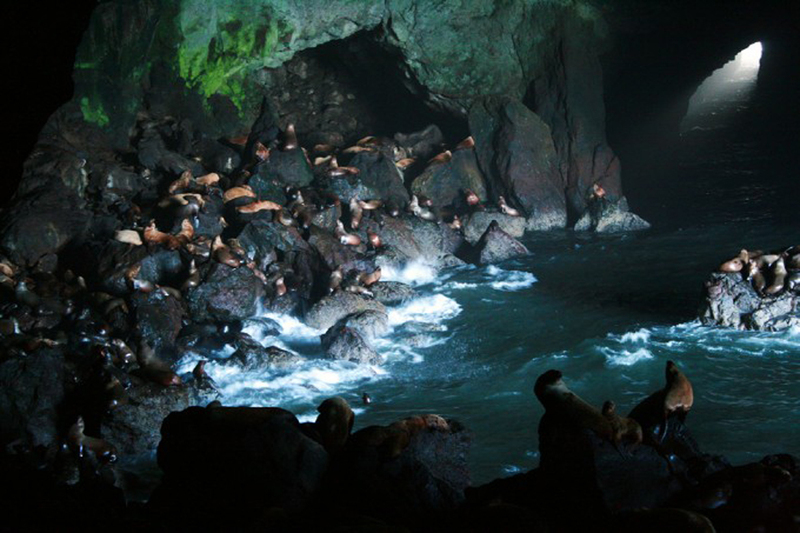 The star of this show is the Steller’s sea lion, the larger of the two West Coast sea lions, and you will see up to 200 of them lounging on the rock in the cave below or diving into the pounding surf that tears into the cave every few seconds. Most people go in the summer. This is a mistake. First of all, you have to fight hoards of tourists and you are whisked down the elevator and back up in as short a time as possible to make room for the next gang. Second, it is in the winter and spring when the sea lions come to the cave to live and breed. I was there in December, which like most months on the Oregon coast, is the rainy season. It was 43 degrees with a steady 20 knot wind, gusting to 35 — there is a weather station on site to keep track of these things — and a constant downpour of icy rain, the kind that soaks down to the bone. In the cave, you are protected from the wind, but it is just as cold and raw, and there is the added pleasure of the barks and yowls of 200 yammering sea lions, which is as loud as certain places at an airport, and the smell, which has been likened to sweat-soaked sneakers, but I say is closer to warm kimchi. The cave itself is immense: The floor covers two acres under a cave-dome 125 feet above the surf. 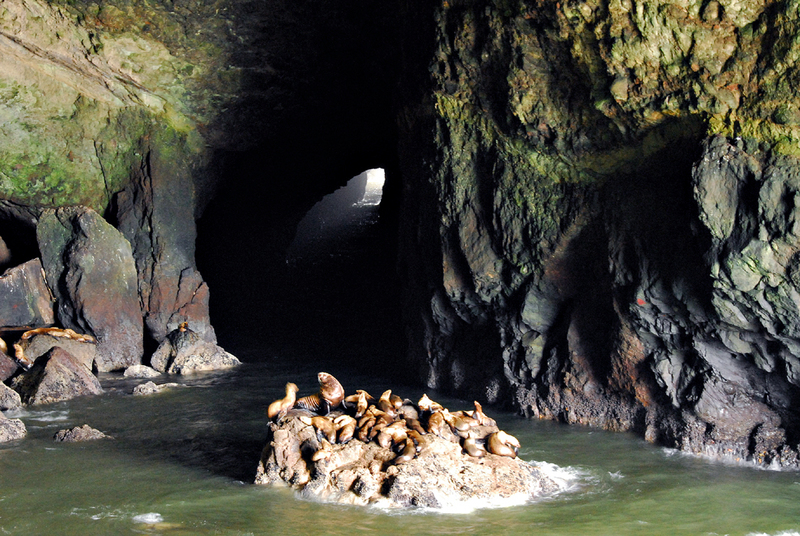 The waves crash into the west-facing opening and slosh and foam across the piles of rock on the cave floor, where the sea lions sit and howl at each other. In December, too, it is very dark in the cave. The low sun and the cloudy skies make for perpetual twilight in the cave; it glows with the burnished light of a cathedral interior. The murk hides the animals at first. It’s hard to see them, although by ear and nose, their presence is well proved. When you adjust to the gloom, you are shocked to see hundreds of them. Some of the rocks you first saw turn out instead to be a mother and her cub. A young male stands on the peak of the highest rock and lets his throat cut loose straight up into the air. The gallery where you stand is 50 feet above the throng, and you are separated from the main part of the cave by a chain-link fence. I watched the goings on — which looked more than anything else I can think of like the floor of a political convention — and only later realized that one sea-lion cow was directly under me on the other side of the fence. I had thought she was a rock, but she rolled over, threw one flipper up into the air like a shark fin and used her hind flipper to scratch her ribs. She got up and watched me watching her. She stared for some time and weaved her head back and forth, the way you see circus seals bob when performing. I weaved back at her. When she finally decided that the long nose of the big sea lion watching her was really only my ball cap, she lost interest and flopped down again to try to sleep. She must have been an insomniac, because she tossed and turned for some time trying to find the comfortable position. The cold finally got to me. I lost feeling in my knuckles. I was the only one in the cave, except for the attendant, a genial elderly man with a cultivated New England manner of speaking. The main natural entrance to the cave was discovered by a fisherman in 1880. He later bought the property, although there wasn’t much he could do with it, as there were no roads in that part of Oregon. It wasn’t until the Coast Highway, now U.S. 101, was built that anyone thought of developing the property. And when they did, they provided a downhill climb of a quarter mile followed by descent down 250 stairs into a secondary natural opening to the cave. It wasn’t until 1961 that an elevator was installed, making the drop to the gallery possible for anyone but the best athletes. Now, that secondary opening is a balcony looking out to the north of the bluff where the cave is situated. 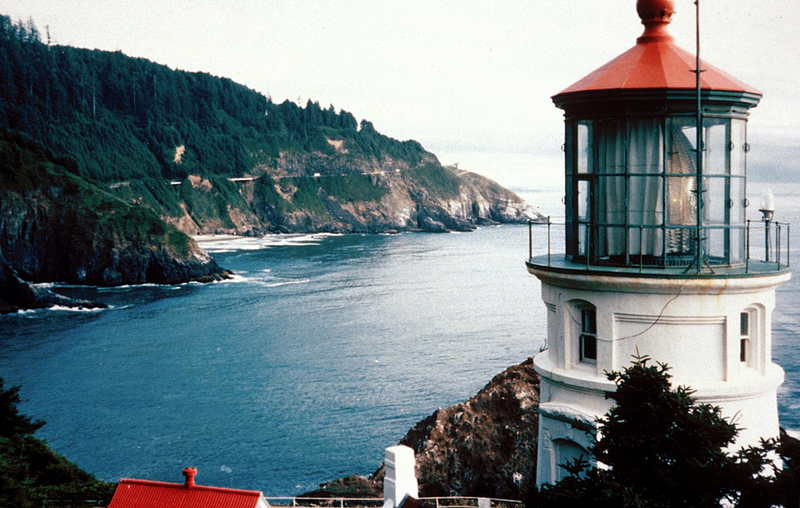 And framed by the rocky window is a view of the Heceta Head lighthouse. No more archetypally Oregon coast scene could be possible: A rocky headland topped with dark green trees is crowned with the squat white shaft of the lighthouse, which beams out its flash every 10 seconds. When I rode the elevator back up and got out into the wind at the top of the cliff, I looked out over the ocean and saw a dark gray squall moving on the surface of the water headed directly at me. I thought it a good idea to go the the souvenir shop and wait for it to pass.